Ask fellow campers about "Tyler State Park" and nearby attractions. In the loop in which we were, most were pull through sites. Our site was one of the few back in and level. Both ATT & Verizon signals were good. A very large park and very busy during the summer/school breaks. Shower house was nice but quite used. Did not use the showers. Tyler SP has it's own good size lake with fishing and swimming and campgrounds scattered around the lake. Very nice park as we hit it during the week early April and it wasn't very crowded. Texas charges a Day use fee in addition to camping fee. Varies from park to park. Tyler was $5 per. 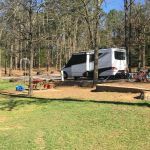 We camped at Tyler State Park in a Motorhome. We booked a site in Lakeview area, 41' pull through, full hookups, close to lake, thinking it would be a breeze to set up. Many sites in this loop aren't too bad, but it appears that the FHU area next, Big Pine, has easier campsites to get level. Ours required backing out, re-entering very near the rock wall of the campsite in order to achieve any sort of level. And even then, heroics and lots of levelers were required to come as close to level as possible. The utilities are situated far ahead of the level area so we had to go to town and buy a 50 amp extension just to hook up to electrical. Utility placement was not convenient in this particular site for a big rig. Once set up, this is a lovely place to stay. Gorgeous scenery, quiet and peaceful place. Many hiking trails, and Tyler is close by for any shopping needs. Verizon signal okay. 2 OTA TV stations. We would love to camp here again. We would love to get an easier site to level even more. We camped at Tyler State Park in a Fifth Wheel. The Azalea District in Tyler is stunning if you're there in March or early April. The rose garden looks like it would be wonderful during season, too. Walmart and Lowes and Camping World are all a short drive. Hike the trails, start a campfire, read a book. It's a place to just relax. We were visiting family for Christmas. Lovely setting; We had no idea so many camped at holidays. level asphalt pad; pull-thru with plenty of room for toad We camped at Tyler State Park in a Motorhome. We camped in the Big Pine campground for two nights with advanced reservations made 257 days prior to arrival. Check-in at Visitors' Center was quick. Firewood for sale (honor system $5 for 8 pieces) near Big Pine restroom/shower house. Big Pine women's restroom was in deplorable condition! Toilets clogged and overflowing. Definitely a health and safety issue and was shocked that Park rangers didn't lock out the public! One of the three stalls was without a door. Was forced to drive to the day use area to use restroom. Non-gender showers were on the opposite side of the restrooms. Lockable, individual shower rooms. Clean. Big Pine drive-thru campsites are very close to campground road. We were warned that park raccoons were aggressively friendly, which was an understatement. When hubby pulled a storage bin from our truck, two raccoons appeared in the middle of the afternoon next to the bin. We can surmise they thought the storage bin was a cooler and they were about to get some grub. We had to shoo them away over and over again. Quiet park - no road noise. It was the weekend prior to Halloween, so each campsite had an option to participate in the campground trick or treat activity. Heavily wooded park. Very nicely stocked Park store where canoes, paddle boats and kayaks can be rented (life jackets provided at no cost). Achieved 2 bars with AT&T cell service. We camped at Tyler State Park in a Travel Trailer. Tyler Rose Garden admission is free! Very walkable garden that is extremely peaceful. A clean and well maintained park. We camped in the Big Pine area on FHU Site 65. Site had a slight slope but easy to compensate. Plenty of room with BBQ and picnic table. Very pretty park with lovely shady trees and lovely trails. Many activities to suit everyones needs. Unfortunately we had a full day of rain that kept us from doing things however we would stay here again and highly recommend. We camped at Tyler State Park in a Motorhome. Visit the Goodman-LeGrand House & Museum in Tyler - well worth a tour but advise to sit and watch the 25 minute video beforehand. Many shops and restaurants at nearby East Tyler. Very clean well maintained park. Camp sites also inviting and user friendly. Fire rings and fire wood available at reasonable price. Beautiful lake for fishing boating or swimming. Great hiking trails of different lengths and difficulty. 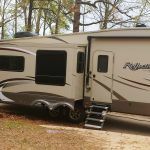 We camped at Tyler State Park in a Fifth Wheel. Park is generally in a run-down condition. Showers and restrooms are in poor condition, but clean. Raccoons have taken over many of the camping areas. If you are out after dark, they are a real nuisance. I am an outdoorsman, so when I say NUISANCE, I mean NUISANCE! We camped at Tyler State Park in a Travel Trailer. Wow, this is a really nice park! Located just north of Tyler and I-20, it feels worlds apart from the hustle and bustle. 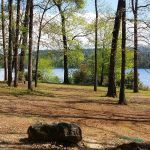 It is quite large, hilly, and scenic with beautiful pines and hardwood trees, creeks, and a gorgeous lake. It offers camping, picnicking, hiking, biking, swimming, fishing, playgrounds, and boating. For boating, you can launch your own, or rent one from the park store, which offers canoes, kayaks, pedal boats, and jon boats. The store also offers souvenirs as well as limited camping supplies and groceries. The park has scenic roads for vehicles and road bicycles, as well as 13 miles of trails for hikers and mountain bikers. It also has many structures that were built in the 1930's by the Civilian Conservation Corps. There are a wide range of accommodations ranging from tent sites with water only, all the way up to full hookup RV sites, screened shelters, and mini-cabins. Some sites are very level, while others have a slope. There are lots of ants in the campsites which invaded our RV after a few days. Depending on which way the wind is blowing, you may hear a little traffic noise from the nearby highways. Water and electric supplies are good, however the power did go out for about 17 hours after a storm. On the technology side, we received about 30 over-the-air TV stations, 4G LTE cell phone service from Verizon, and Wi-Fi internet from the park, although it was slow at times. While all the sites are quite nice, our favorite area is the Lakeview tent and trailer camping area. It is right on the shores of the lake, has great views, and is right on the Lakeshore trail, which is a very scenic and easy 2-mile loop around the lake. We camped at Tyler State Park in a Travel Trailer. We did not have a reservation for a Saturday, so we were put in the overflow for a night. It had a very friendly and quiet group camped there. The washrooms were new and very clean! We had water and electric. Next 2 nights we had full hook up in Area 3. Older washrooms and showers, but clean. great hikes, lake and trees. would stay there again on our way to and from Arizona. We camped at Tyler State Park in a Travel Trailer. Very nice park in the Piney Woods of East Texas. We stayed at site #64 in the Big Pine area with 50amp, water and sewer. Great set of trails to explore, lake is great for swimming and the park also has various boats to rent. Staff is extermely friendly. Very nice Camp Shop with fishing gear, clothes and some various camping items. Having a Texas State Park Pass helps greatly with the parks individual fees and you also get discounts on your first few camping nights. 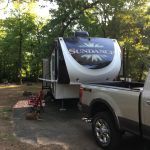 We camped at Tyler State Park in a Fifth Wheel. You can fish for sun perch at the boating center after they close. Kids caught several fish using bread. We stayed one night in Cedar Point Loop, site #7, which is a pull thru with W/E. The park is very close to I-20, so even in "sleep and go" situations, it is worth staying here. The park is tidy, our area was very woodsy and our spacious site backed up to even more forest. We had full LTE coverage (AT&T) and got 30+ channels via OTA. We look forward to returning for an extended visit. We camped at Tyler State Park in a Travel Trailer. Stopped at Tyler State Park in Tyler, TX, for an overnight after a long, stressful driving day. We prefer actual parks to RV "parks" that are more expensive and are just parking lots next to noisy roadways. Our price included the $6 per person entrance fee, which kind of cheeses me to pay on top of the camping fee, but we've encountered this in many state parks. We didn't have the opportunity to explore the park, but our next-site neighbor is a frequent flyer there and had great things to say about it. The setting was beautiful, full mature trees and lots of vegetation. I grew up camping in a park that looked almost just like this, so I loved this place. We had no problem with our 30-amp & water hookups. No problem backing in to our site with a 32-foot class C. There were several pull-through sites in our section. Would love to return and spend some time actually camping there, rather than a stopover. We camped at Tyler State Park in a Motorhome. Beautiful East TX park. We stayed in the Lakeview area, which I recommend. The pretty park is kept up nicely & isn't in the middle of a bunch of meth labs. We found it spotless, including the bathrooms. We have a 25' motorhome and backed into our site, but there are pull-throughs. The campsites are spacious with plenty of area around them should you want to set up a tent. We set up 2 ENO Hammocks, left our bikes out, had a lantern pole, picnic table and fire ring with a grill grate. Firewood can be purchased via the honor system by the camp host's site. We had full hookups and concrete pad, which required leveling blocks. Our site was shaded and on the water. Because of the tall trees, satellite didn't work. No biggie. I didn't pay attention to whether or not there were spots with a clear view to the sky. You can rent boats & fishing equipment. There is a swimming area. If you enjoy biking, birding, hiking or geocaching, there are plenty of options/trails. We took a nice hike around the perimeter of the lake...maybe a couple of miles? The camp store is well appointed. The only issue we ran into were the thieving raccoons who have a taste for prime rib-eye. One of the fearless little buggers managed to steal half of a steak right off the grill when we walked a few feet away! (so much for leftovers!). Our neighbors, who frequent this park, say they are a big problem at this park, so keep your coolers and everything food related inside your car/camper! Sites at TX State Parks are first come first served, although you can reserve a "space" beforehand. The ranger said starting Dec 2017, you will be able to book "site specific" spots online. Day use fee is $3/day per person. We got a TX State Park pass for $40, which negates the day use fee and if you stay more than one night, you get half off the 2nd night. Well worth it if you plan on camping/using TX state parks more than a couple times. Book early; this is a popular park, close to Dallas & fills up during the season. We camped at Tyler State Park in a Motorhome. We stayed 3 nights in the Lakeside camping loop L71 a premium site with full hookups . Nice site with a good view of the lake. This loop is a little tight for maneuvering 40' motorhomes with a toad, but can be done. Sites at our end of the loop were a little closer than we like but much better than most parks. The State Park is only about 2 miles from I20, so is a good place to spend the night if you are passing through. In addition to the nightly rate of $25 there is a $5 per entrance fee unless you have a Texas State Park pass. The campsites can be a little muddy if it is raining and it did rain 2 out of our 3 night stay. We camped at Tyler State Park in a Motorhome. A ton of things to do in Tyler. Don't miss Caldwell Zoo, Tyler Rose Garden, multiple museums, True Vine Brewery (Thur-Sat), Keipersol Winery and unbelievable shopping on South Broadway. The restaurants are just too numerous to list, but if you love beer and pizza, you've got to stop by Rotolo's (31 taps with mostly Texas microbrews). Tyler State Park is just outside the city of Tyler, home of "The Rose Garden of America" which is very pretty and a nice place to walk. Plenty of shopping in the city too, but don't miss out on the country. The little towns around here are full of oilfield history and a lot of peace and quite. Good fishing with 2 piers, 3 types of boats, camp store was inadequate with mostly souvenirs, but a convenience store is right across from the entry. Are you affiliated with Tyler State Park ?